The Forest History Center is located in Grand Rapids, MN. The center focuses on displaying the historical and cultural impact that out forests have had on people and the community. Historically, logging was a large economic driver, presently there is a large use of Minnesota forests for recreational purposes. The center allows visitors to see this changing relationship through exhibits, films, tours, historical reenactments, and other educational and recreational programs. It is one of 26 sites operated by the Minnesota Historical Society. 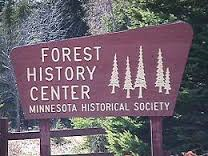 We are most familiar with the site at Forestville which is only a few miles from our home in southeastern (Bluff Country) Minnesota. The museum was great but the highlight of our visit was the recreated logging camp where the blacksmith, saw filer, bull cook, clerk and lumberjacks were all in character and hard at work. We saw draft horses demonstrate feats of strength during cross-hauling and jammer shows as lumberjacks load logs onto skids. Unfortunately we "witnessed" a serious accident during this dangerous work. All enacted with appropriate seriousness and inappropriate hilarity. Take a look! We walk down the hill following the crowd. first shouting and then a SCREAM! and crushed a young man "flatter than a pancake.! On a more positive note the Belgian work horses were both handsome and very strong. Two remain working in the camp and more than twenty were out with the logging crews, we were told. Later, Mrs. T. gets up close and personal. And the visit concludes with music and a chat a logger who just happened to have a guitar. 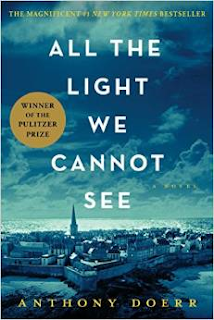 Two books for the price of one? 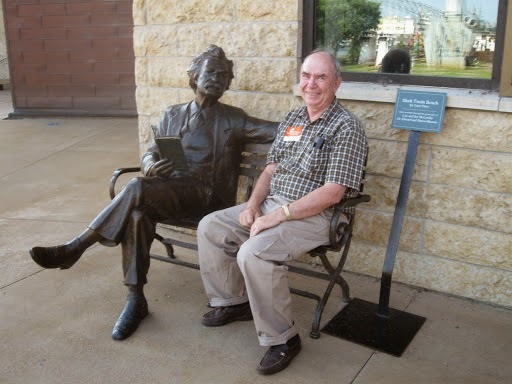 Click on Mark Twain above to see Troutbirders review. 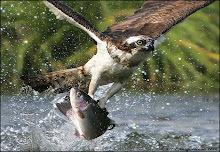 It was mid October 2015 and The Troutbirders were off on another field trip with Historical Adventure & Travel Tours. President John Grabko has spent 30 years within the fields of history, tourism and recreation. He is fulfilling a life-long dream and passion of sharing America's story and past with "adventure travelers" of all ages. 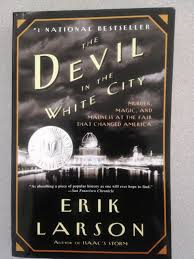 On this occasion were heading off to see the spectacular fall colors in Northern Minnesota, visit the "Lost Forty, and travel back in time to see a nineteenth century lumber camp, the Hinckley Fire Museum and Judy Garlands childhood home in Grand Rapids, Minnesota. Let's Go!!! The lumber boom in Northern Minnesota in the late 1800's saw much of pine forest eliminated. Slash left from logging operations accumulated till forest fires wrecked havoc. One, the Hinckley fire, saw 5 towns destroyed in a "perfect storm" of drought, high winds, rampaging fire and hundreds of deaths. A visit to the Hinckley museum told the story. Hinckley was a booming logging town, with a sizeable sawmill, hotels, restaurants and more than a thousand residents. 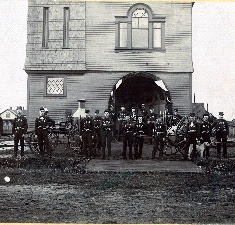 Hinckley had a volunteer fire department, complete with a new fire hall and modern firefighting equipment. But they were no match for the firestorm and were forced to flee, searching alongside their neighbors for ponds, rivers or any water at all to escape the fire. A free marauding goldfish (Pisces marauds) spotted by Baron and myself in a lake at a local State park. Sneaky and dangerous especially when roaming in packs at night, wild "prairie dogs". Fast moving in short bursts and easily mistaken for logs when lying close to shore they can easily leap ashore and grab a an unwary flyfisherman or photographer. Its an alligator (Alligatasaurus Americana) . Peaceful cow like creature I thought till I got close enough for a selfie and used a flash. Then I noticed the wild look in his eye. 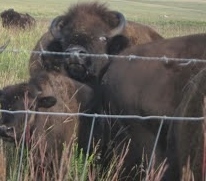 American Bison (Bovina Dangerosa). Click on Mark Twain and Troutbirder above for a book review. 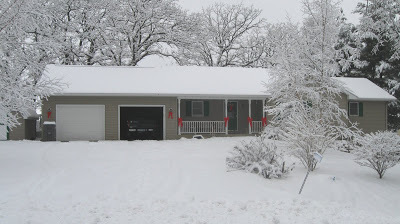 Our now fifteen year old home sits on "Oak Hill." Here, surrounded by magnificent white and burr oaks, I had to give up my sunny gardens. We had divided our property, selling our old house in the open, and building a new one in the adjacent woods. 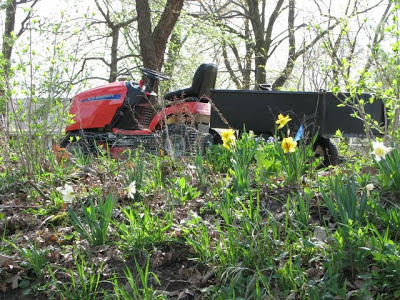 The wooded areas have been gradually converted to shady wildflower gardens. They are now my gardening pride and joy. Still, there was one area I wasn't quite sure what to do with. It was a six foot, east facing bank, on the edge of the woods. Leading down to the ditch along the road, it was a maze of gooseberry bushes, burdock and uncounted weeds. It couldn't be mowed, yet offered a half a day of sunshine. What to do? I decided to try and give it a "prairie look" and hoped the morning sunshine would be adequate. In the fall of 2007, I cut back the gooseberries and prickly ash.. Then, that fall, the bank got burned. 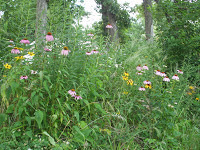 I had already purchased some native wildflower seeds from Prairie Moon, a local wildflower specialist. Raking the ground, then scattering and tamping the seeds, I hoped the spring melt wouldn't wash them all into the ditch. We had lots of snow that winter. There was no way for me to tell that spring as to what came up. I couldn't identify the weeds from the flowers. So I waited till the maze reached about 6-8 inches in June and then weed whacked everything down to about 3 inches. Now my precious wildflowers would have a fighting chance. The bulbs I had planted, of course, bloomed that first spring. The rest would have to wait at least another year before blooming.... if they survived! 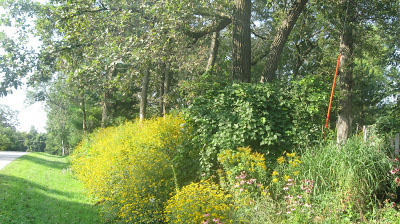 Two years later, the summer of 2009, purple coneflowers, and woodland phlox made their first appearance. August 2011: the brown eyed susans put in a not very modest appearance. The summer of 2015 has seen a cascade of changing color. Now in the early October the “ditch bank” the fall asters have joined the show. 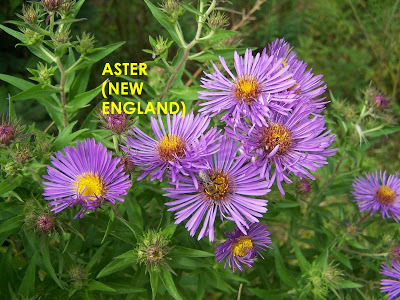 The smooth asters with their sky blue look and the deep purple of the New England ones dominate the show. The latter with remain blooming till the snow arrives…..
Look close. The bumblebees love the asters too! What fun! And the neighbors all toot their horns and wave as they come and go.